A simple recipe for a Green Smoothie that actually tastes good! Looking for an easy way to incorporate spinach into your diet? Look no further! This Tasty Green Smoothie is chock full of fruits and vegetables! Ever since I bought my Vitamix blender just about a year ago, I’ve turned into a smoothie fanatic! Having a high-powdered blender like a Vitamix has simplified the process of making smoothies which means I tend to make them much more often than when I had a standard cheap-o blender. Rest assured, however, because you don’t need a fancy pants blender like a Vitamix to make fantastic smoothies! 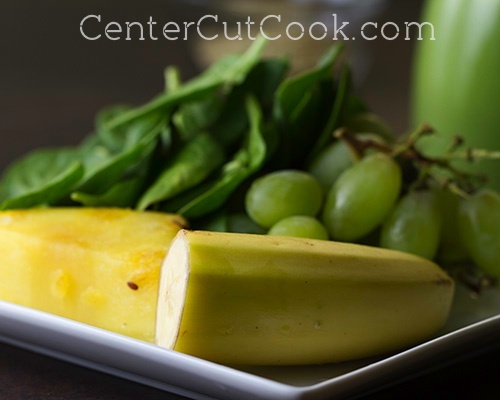 All you need is a great combo of fruits AND even veggies! I’ve tried some green smoothies in my day that were down-right disgusting! Even though the color is beautiful, and the thought of consuming more veggies is appealing, when I was handed this particular recipe for Green Smoothies, I was hesitant! Thankfully my result with this smoothie was different than all of the other recipes of I’ve sampled. It actually tasted GOOD! 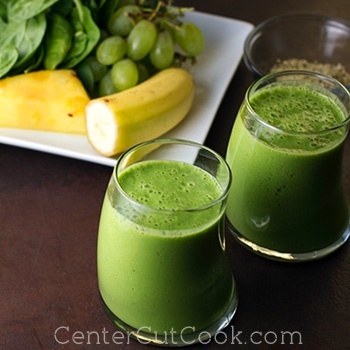 A tasty Green Smoothie chock full of fruits and 2 cups of spinach is never a bad thing! I started out with green grapes, about a cup! Then I added in half a banana, about 1/2 cup of pineapple, and two full cups of spinach! Make sure you wash your fruits and veggies well before using them. 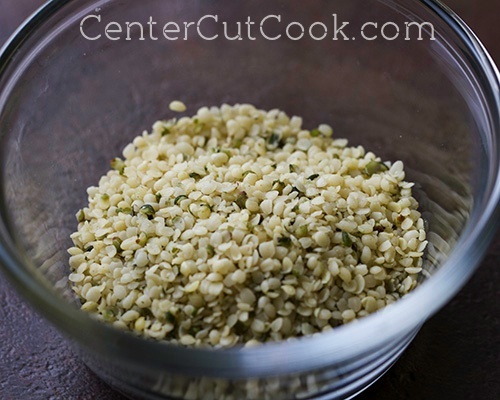 Hemp seeds pack a lot of nutrients into a super small package, and with a powerful blender like the Vitamix that blends everything really well, you can’t even tell there are seeds in your smoothie! I blended everything really well, and ended up with a fantastic healthy smoothie full of fruits and veggies, that actually tasted great! Score! In case you’re looking for other smoothie ideas, I’ve got some suggestions! Place all ingredients in the blender in the order listed and blend on high until smooth. 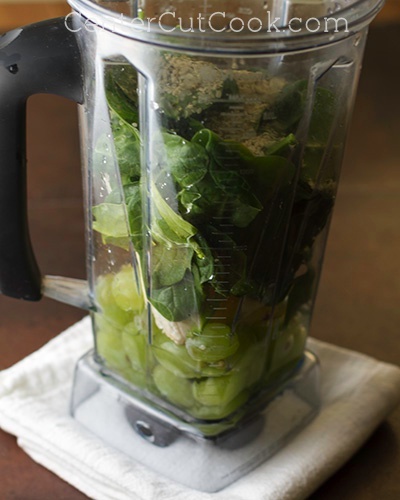 If you’re using a Vitamix, turn on to Variable 1, then increase to 10, and then to high and blend for about 1 minute.